This is my MAME cabinet - Multiple Arcade Machine Emulator. For the uninitiated, that means that this is a full-sized arcade cabinet with a modern computer inside. Using a process called "emulation" it can run the original arcade versions of hundreds of games, from 80's classics like Pac-Man and Centipede to more recent games like Killer Instinct and Area 51. 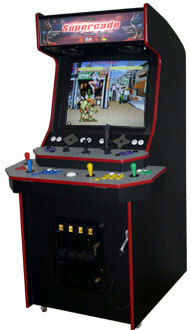 This was the third cabinet that I built, and it is the first MAME cabinet ever to feature a split-level control panel! This unique design offers a multitude of control configurations, including a light gun. Joystick restrictor plates add an extra authentic feel to older games, while a flight stick provides excellent play for games requiring analog input. This split-level design has all of the advantages of swapable control panels, without the drawbacks! The upper controls can be easily used without the lower controls getting in the way. An authentic arcade monitor provides a beautiful arcade-perfect display. Supercade is now in print! Buy this book on Amazon, or directly from Wiley Publishing. The Mamey awards are presented by Massive Mame for excellence in arcade cabinet design and construction. Supercade has received this award for its innovative control panel design. All content on this website is Copyright 2003-2007 by Jeffrey Forester Allen and may not be reused or reproduced without permission.